Why is Trump abandoning his blue-collar base for the ethanol cartel? What if I don’t want 15 percent ethanol fuel in my car or in my lawn mower? Do we still live in a free country? I have nothing against someone earning a living producing and selling ethanol the same way I have nothing against someone trying to sell Obamacare-compliant medical insurance plans. There is, however, a grave problem when government forces us to purchase the product, manipulates the market on its behalf, and mandates that no other product can be sold in that industry. The same fundamental flaw ailing Obamacare is the same problem we face with our ethanol policy. Unfortunately, rather than balancing the interests of blue-collar jobs in oil refineries that are being hurt by these coercive policies, Trump is for some reason so enamored with the ethanol lobby that he is putting the screws to these very workers. This is a betrayal not only of free market policies but of his core promise of keeping blue-collar jobs in states like Pennsylvania. Last night, President Trump announced at a rally in Iowa that the EPA would be lifting restrictions on the sale of E15 – fuel blends of 15 percent ethanol – allowing their market use above 10 percent blends all year, including in the summer, when some are concerned it exacerbates smog. In a vacuum, conservatives should support any effort to countermand any unnecessary regulation on production of any form of fuel. The problem here is that by expanding the leverage of the ethanol industry with more aggressive ethanol blends without concurrently unshackling the oil refineries from the mandate to purchase and blend ethanol at all – the Renewable Fuels Standard (RFS) – it further puts the refiners at a disadvantage. This comes at a time when a major independent refiner in Pennsylvania has filed for bankruptcy because of the out-of-control ethanol mandate. In a sane world, it wouldn’t be too much to ask that we not force one industry to purchase the product of another industry, especially after years of subsidies and tariff protections for ethanol. But it’s worse than that. As I’ve written before, the EPA has invented a trading credit system out of thin air to further hurt refiners and empower the ethanol lobby by a government-created sub-market in the oil industry of speculators. Any refinery that cannot meet the Renewable Fuels Standard and dilute enough of its fuel with ethanol, which is practically any independent small to mid-sized refinery, must purchase RINs (renewable identification numbers) credits. The mandate is set so impossibly high that refiners, who shouldn’t have to purchase any ethanol in a constitutional republic, couldn’t meet the standard even if they wanted to. There is simply not enough demand in the economy to support such a high target. Ironically, this is a case of one venture socialist mandate running into the tailwinds of another. Thanks to the corporate average fuel economy (CAFE) standards, another doozy from the Bush era, which requires that new cars achieve more miles per gallon of fuel, not nearly as much fuel is being used. While this mandate has raised the cost of producing automobiles, it has also succeeded in diminishing the overall demand for fuel. After all, new cars need less fuel to run. As such, refiners are struggling to keep up with the biofuels mandate because there is not enough demand in the economy for them to achieve the targeted 19.88 billion gallons in biofuels blends for 2019. As such, they must purchase these RINs credits, which were never authorized by Congress. The big oil industry has an entire commodities market based on this socialist policy to trade credits. The bidding up of credits by speculators has put independent refiners, such as Philadelphia Energy Solutions, out of business. The cost of RINs has gone from a few pennies to over $1 in just a few years. Consequently, much as with CAFE standards, the big players aren’t hurt by it but stand to benefit from manipulating the new artificial market created by the government. It’s the independent refiners and their blue-collar workers who get shellacked. Philadelphia Energy Solutions, for example, spent $300 million purchasing RINs in 2017, double the cost of its own payroll! And for what? All for a random, unconstitutional, nanny-state mandate to benefit wealthy cronies. Which brings us to the critical question: Through all this discussion over the ethanol mandate, why is Trump giving in to the ethanol lobby, which wants to control other people and industries and is doing nothing for oil refiners who merely want to be left alone? Nobody is pushing to get rid of this odious mandate completely, but why is Trump not even willing to ease some of the RINs credits? This is a violation of free market conservatism and MAGA in a big way. It’s neither conservative nor populist. It’s bad policy and bad politics. Republicans are getting slaughtered statewide in Pennsylvania in the senatorial and gubernatorial races and are at risk to lose three to five congressional seats. The entire purpose of the steel and aluminum tariffs was to benefit Pennsylvania workers, but that clearly has not helped in the election and it is, ironically, unpopular in Iowa with the farmers. Trump is willing to violate free market principles in order to help some Pennsylvania workers by taxing imports and hurting Iowa farmers but then bailing them out with subsidies to ameliorate the problem, yet he is not willing to follow free market principles by merely lifting ethanol fascism mandates on oil refineries in Pennsylvania in order to back the ethanol lobby in Iowa. The statist RFS policy of the Bush administration and its forerunners in the late 1970s was enacted before the great American oil miracle with shale and hydraulic fracking – at a time when they thought we would be on the ropes for energy dependence on foreign countries. Now the gas and oil revolution is so strong that it is being used as a potent diplomatic weapon against Iran and the Europeans who seek to circumvent our sanctions. Why would we sacrifice oil refineries for the ethanol lobby when our national security is being buttressed by free market energy policy? It is truly staggering to ponder the cascading odious effects of this ludicrous mandate. The misallocation of farm land, water use, cattle feed, and energy production – all for a lobby that refuses to compete without its officious tentacles strangling consumers and fuel producers with the force of law. The corrosion of our engines by this product that doesn’t need to perfect itself in a free market. The lower fuel mileage from adulterated fuel with less energy content. The billions in extra costs to the restaurant industry because of the higher cost of beef, thanks to scarcity of cattle feed. The mandate has distorted the reality of every market so much that 44 percent of all corn is grow for ethanol, dramatically expanding the corn market. Mr. President, this is as swampy as it gets. This is the Swamp vs. consumers, producers, and common sense. Trump said at the Iowa rally that his ethanol policy is an example of “promises made, promises kept.” Yeah, tell that to those laid off at oil refineries. Pennsylvania’s two senators — Republican Pat Toomey and Democrat Bob Casey — have been on opposite sides of the sharply divided Senate amid the bruising battle over Brett Kavanaugh’s nomination to the Supreme Court. Their comments on how that nomination fight unfolded show the deep tensions regarding the nation’s top court, both within the Senate and the country. Reflecting Saturday on the nomination process, Toomey expressed frustration with the intense partisan fight that immediately ensued when Justice Anthony Kennedy announced his retirement. Activists on both ends of the political spectrum mobilized to support and oppose Kavanaugh through outreach to voters and protests that continued outside the Capitol leading up to the final vote. “There’s something deeply wrong with our perception of the court when a single vacancy produces such a brutal and bitter battle,” Toomey said. Toomey dismissed the idea that the move by Senate Republicans not to consider President Obama’s 2016 Supreme Court nominee, Merrick Garland, played into the current contentious nomination process. “As long as we have a huge segment of our society and a entire political party that is dedicated to using the court to advance a policy agenda, then we’re probably going to have these brutal battles,” he said. Casey and other Democrats, however, direct similar blame at conservatives, who they view as also driven by ideological concerns in judicial picks. When it came to President Donald Trump’s selection for the current vacancy, both Pennsylvania lawmakers made their positions clear early on. Casey said before Kavanaugh was tapped that he would not support any of the potential justices on a list compiled by the conservative Heritage Foundation. Toomey announced after meeting with Kavanaugh in July that he would vote for him. Neither Pennsylvania lawmaker serves on the Judiciary Committee, which has the first chance to sign off on nominees. They supported the panel’s decision to hear from Christine Blasey Ford after she came forward publicly with her allegation that Kavanaugh sexually assaulted her at a party when they were both in high school. Toomey said he would listen to and consider Ford’s testimony, and afterward stated that he found Ford’s account to the Judiciary Committee to be “sincere and moving.” But Toomey also said her account lacked corroboration. For Casey, Kavanaugh’s response to the accusation from Ford and later several other women raised more concerns about the nominee. He described the nominee’s demeanor during the confirmation hearing as “atrocious” and reflective of the partisan parts of his resume. As for the Senate itself, Toomey noted that this week, the chamber also passed big bipartisan measures on the Federal Aviation Administration and the opioid epidemic. Nine Pittsburgh-area manufacturers have been harmed financially and are looking for tariff exemptions. As a presidential candidate, Donald Trump declared to Pittsburghers that steel was coming back. Now as president, his tariff policies may be hurting companies that work with steel. According to a list compiled by Sen. Pat Toomey (R-Lehigh), the Pittsburgh area has nine manufacturers that are being harmed by Trump’s tariffs on steel and aluminium. In a letter sent to Trump’s Secretary of Commerce, Wilbur Ross, Toomey writes that tariffs have done significant damage to Pennsylvanians. “The decision to impose taxes under the false pretext of national security has significantly diminished the ability of domestic manufacturers to provide affordable finished products to American consumers,” writes Toomey. The senator has backed most of Trump’s policies. This letter marks one of his first and strongest criticisms of the president. Toomey cites a steel-fabrication facility, NLMK, has paid more than $700,000 every day to comply with the tariffs. Toomey’s letter lists 37 businesses throughout Pennsylvania. Pittsburgh-area business include: Allegheny Technologies Inc., Ameri-Source Specialty Products, Forms & Surfaces in Pittsburgh; Ardagh Metal Packaging USA in Carnegie, CP Industries in McKeesport, FS Elliot in Westmoreland County, Krupalu International in Coraopolis; and Pioneer Tool & Forge in New Kensington. The biggest Pittsburgh-area company to be affected is the Shell ethane cracker plant in Beaver County, which will provide hundreds of temporary jobs during construction and 600 permanent jobs upon completion. Toomey says the tariffs could not only hurt its viability, but the hundreds of temporary construction jobs it’s creating. Toomey, long a proponent of free trade, is urging the White House to provide exemptions to these Pennsylvania businesses. Toomey’s letter says that only about 12 percent of the companies seeking exceptions have received them. Toomey wants the commerce department to pick up the pace. “I remain concerned that the [commerce department’s] exclusion process is unnecessarily burdensome, resulting in the delay of timely determinations for American companies seeking financial relief,” writes Toomey. Trump took to Twitter today, scoffing at any idea that is tariffs are hurting the economy. In a meeting in Senate Majority Leader Mitch McConnell’s office almost a year ago, Pat Toomey and Bob Corker reached a deal: They would include a tax cut of up to $1.5 trillion in the Republican budget. Few realized it at the time, but their agreement was critical to the realization of the GOP tax code rewrite. For one thing, by agreeing on a budget, they unlocked the special legislative procedure that allowed them to circumvent a Democratic filibuster. And by allowing for $1.5 trillion in revenue losses in that budget, they created fiscal space for the tax cuts they’d been dreaming of for years: Lower corporate rates, lower individual rates, a shrunken estate tax, and much more. The budget deal was just one of several Toomey interventions that proved critical to passing the GOP tax bill. “He was like the field marshal, so to speak,” said Stephen Moore, an adviser to top Republicans and supply-side evangelists. Although he doesn’t have the national status of some of his conservative Senate GOP colleagues, Toomey has worked behind the scenes and used the levers of power in the Senate to enforce and advance supply-side conservatism during the Trump era. On taxes, financial regulation, Obamacare and free trade, he’s managed to set the right edge for the Senate Republican caucus, all while representing a purple state. He has helped President Trump as much as anyone when Trump has pursued free-market policies. But, unlike erstwhile supply-side conservatives who have accommodated themselves to populism this Congress, Toomey is not simply following the Trump train down the tracks. Instead, he’s providing congressional resistance to the president’s protectionist trade agenda. While other Republicans were still simply finding their footing in the new Trump-dominated landscape, Toomey began drafting a plan for the unified GOP government to undo just about all of President Obama’s domestic legacy. Toomey, having just won reelection in a come-from-behind victory, plotted for Republicans to undo Obama’s healthcare law, his tax hikes and his Wall Street reform, all without wasting time trying to gain Democratic support. Even before Trump took the oath of office in January of 2017, Toomey began pressuring his GOP colleagues on the Senate floor to sidestep a Democratic filibuster and undo big provisions of the Dodd-Frank Act, using the procedural tool of budget reconciliation. That tool allows legislation to pass with only a simple majority in the Senate, and Republicans would use the same procedure for health care and tax legislation. The GOP would eventually fall short of repealing Obamacare or Dodd-Frank. But in both cases, Toomey shaped GOP policy and then later won more modest victories. Senate Republicans’ doomed Obamacare replacement, for example, contained a major healthcare spending reduction won by Toomey. The bill would have tied federal funding for Medicaid, the low-income health program administered by states, to the number of people in each state. That funding then would have been capped to grow with overall inflation, rather than with medical prices, resulting in huge spending reductions over time. Republicans initially rejected the idea of much lower Medicaid spending. Toomey convinced them, or at least most of them, by arguing that it is simply unsustainable for a spending program to grow faster than the economy in perpetuity. Ultimately, the GOP failed and the reform wasn’t signed into law. But Toomey would later succeed in repealing at least part of Obamacare as part of the tax bill. The tax legislation zeroed out Obamacare’s individual mandate penalties, thanks to an amendment added by Toomey and Arkansas Republican Tom Cotton. The mandate elimination was also another idea that scared many Republicans, who were fearful of importing the politics of healthcare — a loser — into the push for tax cuts. Eventually the whole Senate GOP bought into the idea after the budget math was explained: Repealing the mandate would mean fewer people signing up for subsidized healthcare plans, creating savings that could be used for tax cuts. Unlike the Obamacare repeal, the tax overhaul did clear the Senate and reached Trump’s desk, a process kicked off by the Toomey-Corker budget deal. Before the deal, when Republicans were first turning to taxes after giving up on healthcare, their leaders shared a goal that the tax bill should not add to deficits. Any revenues that would be lost through lower rates would have to be recouped by eliminating a commensurate number of special tax breaks, credits, deductions and loopholes. Politically, it was a treacherously difficult task, one that eluded Congress for a generation. Both McConnell and House Speaker Paul Ryan had called for such revenue-neutral tax reform. They did so partly for procedural reasons: Under the budget reconciliation rules, a money-losing tax overhaul would have to be made only temporary. A hurdle emerged when some supply-side Republicans calculated that it would cost the Treasury at least $5 trillion over 10 years to enact all of the tax cuts that Republicans wanted, including the 20 percent corporate tax rate, estate tax repeal, and individual tax reductions. Republicans could only come up with around $3 trillion in tax breaks they would eliminate, even if they killed the most popular credits and deductions. There was simply no way to close the $2 trillion-plus difference. In response, Toomey advocated for the budget to allow for $2.5 trillion in deficits. Knowing that a revenue-losing tax cut could not be permanent under reconciliation, Toomey had been campaigning since the spring for a creative workaround. His suggestion was to lengthen the budget timeframe from the typical 10 years to 20 or 30 years — unusual, but not prohibited. A tax cut of that length, even if technically temporary, would be permanent for businesses’ investing purposes. “We can’t let a fixation on deficit predictions or arcane budget rules get in the way,” Toomey argued at the time. Corker, meanwhile, a self-described fiscal conservative, wanted the revenue losses to be $0. Seeing the differences between the two senators, McConnell in August directed the two of them, both members of the Budget Committee, to find a compromise. After several weeks, the two settled on the $1.5 trillion figure. That was the outer limit of what Corker thought could be made up by faster economic growth if they went on to write a tax bill that sparked enormous new business activity. From the Toomey perspective, the $1.5 trillion limit would mean giving up some of the tax cut goals the GOP started out with, but would still allow for a lot. In the end, the bill would include many, if not all, of the supply-side priorities. By the time Sen. Ted Cruz, R-Texas, held a Capitol Hill press event in mid-September to demand a hard-right tax bill filled with a wish list of cuts, Toomey was already nearing the deal with Corker to achieve what he wanted. In the area of finance, Toomey didn’t get his way. The chairman of the Banking Committee, Mike Crapo, R-Idaho, chose instead to work with Democrats to pass a centrist regulatory relief package, rather than attempt to ram through a partisan rollback of Dodd-Frank. Nevertheless, Toomey found other avenues to push the envelope on deregulation. Toomey is “doing as much as he can behind the scenes to wring out every last possible benefit of having full Republican control in Washington,” one financial services lobbyist remarked. For example, in May, Congress passed and Trump signed a measure ending an Obama-era crackdown on discriminatory auto lending by non-dealer finance companies, a regulatory rollback facilitated by Toomey. The elimination of the regulation was procedural ingenuity. The Congressional Review Act allows for Congress to strike down new agency rules through a simple majority vote, without a filibuster. What makes it complicated is that the auto lending regulation wasn’t officially a rule, and it wasn’t new. Rather, it was regulatory guidance that the Consumer Financial Protection Bureau had published in 2013 informing third-party auto financiers that they were subject to laws preventing discriminatory lending. Republicans had long complained that the 2013 move was an example of Obama overreach, with an agency flouting the law to impose controversial regulations on an industry — auto dealers — that it was prohibited by law from regulating. In 2017, Toomey found a way to take action. His office requested that the Government Accountability Office issue a ruling whether the CFPB guidance could be treated as rule for Congress’ purposes, an idea exhumed from the legislative record of 2008, when Democrats tried to kill a memo published by the George W. Bush Department of Health relating to the implementation of the State Children‘s Health Insurance Program. When the GAO said that the guidance did constitute an official rule, Congress passed a Congressional Review Act resolution striking it down as if it were a new rule, with the eager support of the finance and auto dealer industries. The maneuver raised a prospect that frightened Democrats: Congress could reach deep into agency archives and pull out old regulations to kill. Toomey has always been a conservative lawmaker. He amassed a right-wing record as a congressman from 1999 to 2005, and then ran the Club for Growth, an outside group that backs staunch conservatives and opposes primary Republicans who deviate from low-tax, low regulation orthodoxy. But now he is in a position to wield tremendous influence over fiscal policy, and has the experience to do so. His power could grow even greater next year, if Republicans maintain control and he ascends to the Banking Committee chairmanship, as some members and lobbyists speculate he might. When Club for Growth president David McIntosh, then representing Indiana, served with Toomey in the House, the two new lawmakers would joke that their conservative efforts were undercut by higher-ups cutting deals in some backroom from which they were excluded. Last year, as Toomey was working on deals on healthcare, taxes and finance, he joked to McIntosh that the backroom is real — and the dealing is even worse than they both suspected. Toomey “plays the inside game almost better than anybody I’ve ever seen,” said James Wallner, a former GOP Senate aide who now researches legislative procedure at the R Street Institute. He works, Republicans said, not by trying to position himself in the ideological middle, but rather by staking out his own conservative positions, developing strong arguments for them, and then working to find compromises with his colleagues. He spends more time than most senators thinking through the issues the same way a debater would — testing lines of argument and preparing for rejoinders in order to present a coherent case for his positions — rather than just talking points. Toomey was one of a group of four senior Finance Committee Republicans who took responsibility for explaining the tax plan to other Republicans and easing their qualms. The group spoke with senators individually, or when they came across a particular issue, the four would sit down with one or multiple members — conservative, moderate, or in between — in McConnell’s office to talk it through. In mid-November, when Ron Johnson, R-Wis., announced that he would oppose the tax bill because it put small businesses at a disadvantage, it was Toomey who took the lead in working through the hold-up and saving the bill, said Moore. “People don’t realize how close we came to not getting that bill passed,” he remarked. Johnson, who began his career as an accountant, was holding out for bigger tax breaks for businesses that file as individuals, such as sole proprietorships and partnerships. He feared that without bigger tax breaks, such “pass-through” businesses would be left at a disadvantage to the C corporations that were slated to get a tax rate of near 20 percent. A C corporation, under United States federal income tax law, refers to any corporation that is taxed separately from its owners and it is distinguished from an S corporation, which generally is not taxed separately. Toomey was able to speak to Johnson at at technical level. Their offices exchanged many versions of spreadsheets comparing effective tax rates for different business structures and scenarios. Eventually, Republicans found a way to increase the break for pass-through businesses to a size big enough to switch Johnson to a “yes” vote. The same approach that he’s used in the Senate has served Toomey well in Pennsylvania, a commonwealth much less conservative than his voting record. Lerner suggested that Toomey wins support from voters who don’t necessarily agree with his conservative worldview because they see that he comes by it honestly and through study. His success has been a source of frustration to state Democrats who have been unable to convince voters, so far, that he is as conservative as he is. “Senator Toomey and his Republican friends have spent the past two years pushing a tax plan that hurts the middle class by increasing their taxes, stripping them of their healthcare and protections for pre-existing conditions, and laying the burden of debt on their children,” said Brandon Cwalina, a representative for the Pennsylvania Democratic Party. For Republicans, though, Toomey’s ability to amass a hard-right record in a purple state means that he should get extra credit. “His job is harder because he’s got to do more to sell his views to his constituents,” said Phil Gramm, a former Texas senator and staunch supply-side fiscal conservative. Gramm, a former academic economist, said Toomey was the congressional leader on free-market orthodoxy, in a group with only Rep. Jeb Hensarling, R-Texas. He noted, though, that Hensarling faces little risk back home in the Dallas suburbs of being seen as too far to the right. Toomey bought himself a lot of space on economic issues by departing with other conservatives on the gun issue. In the wake of the Sandy Hook Elementary School shooting in Newtown, Conn., he introduced legislation in 2013 with Democrat Joe Manchin of West Virginia to expand background checks. The effort cost him with some right-wingers and risked alienating voters in rural Pennsylvania, but “gave him credibility in the suburbs,” said McIntosh. Another key strategy in his 2016 race was to keep Trump at an arm’s length, infamously declining to say whether he’d vote for him until right before polls closed. Perhaps no legislator has done more since to aid Trump’s legislative victories on taxes and banking. But now Toomey is poised for conflict with Trump over his trade agenda. Last month, the Senate voted 88-11 on a non-binding resolution calling on Trump to get approval from Congress before imposing tariffs using authority supposed to be used for national security purposes. Trump has used that authority to impose broad steel and aluminum tariffs and threaten more levies on trade counterparties. The vote won’t actually tie Trump’s hands. Republican leaders have avoided forcing members to take a vote defying the president. Yet the resolution, authored by Toomey and Corker, presents a model for Congress to act if, in the future, Trump goes so far that reluctant Republicans have no choice but to cross him. “It’s time for Congress to reassert its constitutional responsibility on trade,” Toomey said after the vote. “We’ve crossed the Rubicon,” on Trump’s trade policies, the Pennsylvania senator Politico in June. It’s a particularly risky stance for Toomey given Pennsylvania’s heritage as a pro-union, pro-protectionist economy. Pennsylvania’s other senator, Democrat Bob Casey, has been more welcoming of Trump’s tariffs and less supportive of legislation to limit Trump’s tariffs power. “For him to be out in front on things like free trade and sort of rejecting populism in favor of free market economics is a really big deal,” said Jason Pye, vice president of legislative affairs for FreedomWorks, a libertarian advocacy group. Toomey’s partner on the tariffs legislation, Corker, is from a state that is traditionally more supportive of free trade. Corker’s also retiring after this year, and won’t have to answer for defying Trump to primary voters. WASHINGTON – U.S. Sens. Rob Portman (R-Ohio), co-chair of the Senate Ukraine Caucus, and Bob Menendez (D-N.J.), ranking member of the Senate Foreign Relations Committee, on July 26 commented on their bipartisan resolution strongly condemning the Russian Federation’s illegal occupation of the Crimean peninsula, while reaffirming the U.S. policy recognizing Crimea as a sovereign part of Ukraine, after it was passed by the Senate Committee on Foreign Relations. President Donald Trump’s statement Monday indicating that he believed the word of Russian President Vladimir Putin over his own intelligence agencies on meddling in the 2016 elections drew strong reactions from Pennsylvania’s U.S. senators. During a news conference featuring Trump and Putin after their face-to-face summit Monday in Helsinki, the U.S. president was asked if he believed the Russian president or U.S. intelligence agencies on whether Russia meddled in U.S. elections. Toomey, R-Lehigh Valley, didn’t mention Trump by name in his statement but instead attacked Putin. The senator said that American intelligence agencies confirmed that Russians meddled in the 2016 elections and that it was almost certainly at the direction of the Russian government and Putin. MARGARET BRENNAN: We’re back with Republican Senator Pat Toomey. He joins us from Bethlehem in his home state of Pennsylvania this morning. Senator welcome to the program. You just heard Senator Blumenthal lay out his arguments as a Democrat his concerns about a Supreme Court nominee. I want to ask you. He has raised this question of if the special counsel’s investigation ever makes it to that court, whether this kind of nominee could become a problem given that the president will be selecting someone who could potentially decide on him. SENATOR PAT TOOMEY: Margaret, I think that’s a ridiculous argument that’s made as just an attempt to make wait for their real position which is that President Trump should never be able to confirm a vacancy. Look I don’t remember hearing the Democrats making that argument when President Bill Clinton, was in fact personally under investigation when a vacancy occurred. My understanding is that President Trump is not himself personally the subject of the investigation, even. So I think that is a non-argument and we needn’t pay any attention to it. MARGARET BRENNAN: I want to ask you about something you’ve been very vocal about lately. This is your concerns, your criticism, of the president’s trade policies. Today- starting today- Canada is putting tariffs on a number of American made products including chocolate, ketchup, up other items. How much is this going to cost your home state? SEN. TOOMEY: Well it’s going to be harmful to my home state. So far this trade war, if it is that, and it seems to be heading that way has been of a modest scale it hasn’t done great damage yet but it has the potential to do that. And it would be an unbelievable pity to disrupt what is really a fantastic economy because of tax reform because of regulatory relief. We’ve got strong economic growth tremendous employment prospects. So I don’t want to see a trade war undo that undo that and limit the ability of Pennsylvanians and Americans generally to buy and sell goods and services with our neighbors and allies which is after all who this is targeting. MARGARET BRENNAN: You have tried and now failed twice to take back, in Congress, some control over the president’s ability to put these tariffs in place, citing national security grounds. So would you withhold your vote to confirm a Supreme Court nominee in order to get the kind of vote you’re asking for on tariffs? MARGARET BRENNAN: Has Republican leadership given you a date? SEN. TOOMEY: –That- we will have multiple options, Margaret, where there is no procedural opportunity for the minority party to block the vote. We will have this vote, and Senator McConnell and my Republican colleagues are not going to attempt to block the- ability to have that vote. And we’ll see where the votes are. We don’t know that yet, but I think we should find out. MARGARET BRENNAN: The president did seem to back down a bit on these investment restrictions that had been floated for China. Do you see him backing down on the question of tariffs? SEN. TOOMEY: So here’s my hope, my hope is that we can persuade the president to focus on the real problem on the trade front. The problem is not Canada. The problem is not Mexico. I mean with Canada we have a trade surplus. We have a surplus even in steel. So why we should punish my constituents with the tax when they import these small amounts of Canadian steel makes no sense. The real problem is the really bad behavior of China, specifically the theft of intellectual property, coerced technology transfers. What we ought to be doing is make peace with our allies with whom we trade to our mutual benefit, and join forces and deal with the real problem and China poses a real problem. I think the president knows that that’s a real problem. And so my hope is that we can persuade him to focus there. ALLENTOWN — U.S. Sen. Pat Toomey, R-Pa., has cosponsored legislation that would suspend destructive taxes inflicted on the newspaper and publishing industries until the economic health of the industries is examined. In August 2017, the Commerce Department and International Trade Commission (ITC) began an antidumping investigation of uncoated groundwood (UGW) paper from Canada in response to the concerns of one domestic paper manufacturer. Commerce has since made a positive determination and is now forcing American newspapers and publishers that purchase UGW paper to pay duties of up to 32 percent. The U.S. is a net importer of UGW paper, so it relies on imports to satisfy demand, and Commerce’s action will have a severe impact on the publishing industry, potentially causing higher prices for subscribers, fewer jobs, and reduced circulation figures. The bipartisan Protecting Rational Incentives in Newsprint Trade Act of 2018 (PRINT Act) calls on the U.S. Department of Commerce to suspend the collection of duties and to conduct a study into the economic health of the U.S. newspaper and publishing industries. Following the completion of this study, the president would be required to review the study and certify that such a tax on imported UGW paper is in the best interest of the country. President Trump has repealed auto-lending guidance from the Consumer Financial Protection Bureau (CFPB), revoking a rule that was put in place to protect minority customers from predatory practices. The CFPB took aim at dealer markups in 2013. Under former Director Richard Cordray (D), the CFPB warned auto dealers that the use of markups on third-party loans could lead to a lawsuit from the agency under anti-lending discrimination laws. The CFPB policy seemed immune from repeal until last December, when the Government Accountability Office ruled that informal agency guidance could be repealed under the review law as if it were a formal rule. Sen. Pat Toomey (R-Pa.), who requested the analysis, introduced a resolution to repeal the auto lending guidance soon after. Acting CFPB Director Mick Mulvaney in a statement praised Trump and lawmakers for repealing the auto guidance and said the bureau would consider submitting other similar policies for congressional review. Pat Toomey is the Milford Man of the U.S. Senate. (He even hails, coincidentally, from Upper Milford Township.) Senator Toomey has all the vigor of a can of beige paint. If the Koch brothers had ever discovered an ideologically sympathetic sea cucumber, that sea cucumber could easily have followed the same career path as Pat Toomey. Unlike many of his pals in the G.O.P., Pat Toomey knows how to keeps his head down. He doesn’t showboat on the Senate floor. He hides from his constituents. He only goes on the Sunday talk shows when need be. And all the while, he continues to quietly wage class war on behalf of his party and its corporate benefactors. The final tax bill signed by President Trump lowers the top individual rate to 37 percent from 39.6 percent, reflecting one of many triumphs for the “supply-side” economic doctrine Toomey has relentlessly promoted through more than two decades in politics over the more populist ideology of Trump’s campaign. Behind the scenes, according to aides, lobbyists and fellow lawmakers, Toomey played a major role in shaping the Republican tax overhaul — pushing not only for a cut in the top individual rate but also helping slash rates for corporations and repeal a key provision of the Affordable Care Act. Because of the simple fact that he is a total bore, Toomey sometimes passes for a Moderate Republican. The beltway press has branded Toomey a “fiscal hawk,” because apparently “investment banker-turned-Club For Growth stooge who looks like one of the anti-mutant senators in a 2000s X-Men movie” is too long an honorific. Of course, as a fiscal hawk, whose purported main concern is getting the federal deficit in line, Toomey was instrumental in crafting a tax reform bill that explodes the deficit through massive tax breaks aimed squarely at rich people and corporations. In a way, you have to admire Toomey. While his showboating colleagues were reading Green Eggs and Ham on the Senate floor, Toomey was lying in wait, biding his time until the next Republican president took office. He never took his eye off the prize: quietly, politely stripping away social protections for vulnerable Americans while further enriching himself, his peers and the donor class. It’s easy to get outraged at the Donald Trumps and the Ted Cruzes of the Republican Party, because people like Donald Trump and Ted Cruz have a desperate, unfillable pit in their souls that makes them seek out negative attention at every turn. They are cartoonish villains, who use intentionally inflammatory and at times radically authoritarian rhetoric. But the real face of Republican policy radicalism is Pat Toomey. Quiet, polite Pat Toomey. Voters aren’t outraged by Toomey, and his radicalism isn’t labeled as such by most of the press, because at the surface level, he is an utterly inoffensive human being. And if Pat Toomey has his way, he’ll keep his nose down, hiding from his constituents, not making any waves, not offending anyone. He doesn’t want you to get angry at him because he wants to keep his job. He wants to keep helping his friends, and he certainly doesn’t want you to notice him doing it. WASHINGTON — This is why Sen. Pat Toomey came to Washington. With the final passage of his party’s tax bill Wednesday, the Pennsylvania Republican scored a landmark personal achievement — sharply cutting taxes in the aim of spurring economic growth, a goal that has driven his work in public life. Toomey had a front-line role on the controversial plan, helping to write it, sell it in public, and defend it on the Senate floor. It was the culmination of work he has pursued since joining the House in 1999, in leading the conservative Club for Growth, and in his seven years in the Senate. A former derivatives trader and owner of a small chain of sports bars near Allentown, Toomey made regular trips to White House talks and was one of four GOP senators charged with explaining the bill to colleagues at lunch meetings. When the first Senate version passed earlier this month, Toomey spent hours on the chamber’s floor, papers stacked on his desk as he jousted with Bernie Sanders, Pennsylvania’s Bob Casey, and numerous other Democrats who arrived to criticize it. At one point, Sen. Cory Gardner (R., Colo.) walked up to Toomey and silently pumped his fist in encouragement. Toomey has long been one of the GOP’s most prominent voices on fiscal policy, pairing staunchly conservative views — often to the right of fellow Republicans — with wonky details boiled down to digestible talking points and a mild demeanor that belies his firm viewpoints. Toomey also had a leading role this year in trying to repeal the Affordable Care Act, pushing hard to roll back Medicaid funding. He pressed to make the tax cuts as large as possible, despite projections that they could explode the deficit. The measure Toomey helped craft, however, is deeply unpopular, according to multiple public opinion polls, and the overwhelming consensus among nonpartisan analysts is that its largest benefits will go to the wealthy and businesses. Toomey said the bill would provide benefits across the income scale and would more than pay for itself by stirring new economic energy. “The vast majority of working and middle-income individuals and families get a direct tax cut,” he said. On the face of it, Toomey’s fervent advocacy of the tax bill contradicted another core element of his fiscal philosophy — opposition to deficits. Nearly every recent nonpartisan analysis predicts the tax bill will increase deficits. So do staunch deficit hawks, and a wide array of top economists. The Penn Wharton Budget Model, for example, predicted $1.9 trillion to $2.2 trillion in new debts, even while accounting for economic growth. Most other analyses projected at least $1 trillion in added debt. Toomey has opposed spending bills for much less. He voted last year, for example, against plans to spend $600 million on opioid treatment, citing the red ink. On this measure, however, he negotiated a critical GOP deal to allow for $1.5 trillion in new debt to fund the plan and, according to the Washington Post, floated the idea of an even bigger cut to stake out a stronger negotiating position. Toomey predicted a stronger economic boost than many analysts expect, saying 0.2 to 0.4 percent of growth above existing projections over the next decade would be enough to pay for the cuts and possibly cut the deficit. “You have to be very pessimistic about America’s future to think that we can’t achieve that, and I am not pessimistic about America’s future,” he said. Some Republicans are eyeing another long-standing aim for fiscal conservatives like Toomey: scaling back spending on Social Security, Medicare, and Medicaid. Toomey has long argued that they are growing too fast and must be reined in to be viable for future generations. Democrats are ready to pounce if that happens, noting that Republicans have just undercut federal revenues. Toomey said it’s about spending. “You can’t tax your way to a solution,” he said. NEW YORK (Reuters) – U.S. lawmakers from states that produce corn for ethanol plants said on Wednesday they would consider proposals from Senator Ted Cruz of Texas to help the oil refining industry cope with the nation’s biofuels regulation, but would never agree on anything that diminishes the program. The price of U.S. renewable fuel credits sunk to their lowest levels in two months amid ongoing efforts by President Donald Trump’s administration to mediate talks between the rival oil and corn industries over the Renewable Fuels Program. Representatives of both sides gathered on Wednesday at the White House and it was agreed that Cruz would circulate proposals to corn-state lawmakers in the weeks ahead that could help oil refining companies meet the RFS, according to the offices of Iowa Republican Senators Chuck Grassley and Joni Ernst. The RFS requires refiners to blend increasing amounts of biofuels like corn-based ethanol into the fuel supply every year, a burden the refining industry says now costs it hundreds of millions of dollars every year and threatens to put some refineries out of business. Cruz and senators from other states with refineries had asked the White House in a meeting last week to help bring corn state interests to the negotiating table to help find a solution. The discussions have fueled speculation that the two sides could come up with a way to help refiners deal with the costs of compliance credits under the program without undermining the interests of the ethanol industry. “The integrity of the RFS is Senator Grassley’s priority and there was an understanding expressed broadly in the meeting that any outcome can’t undermine the integrity of the RFS,” Grassley spokesman Michael Zona said. “While we are happy to review any proposals Senator Cruz offers in the time ahead, we remain firm that our top priority in these meetings is ensuring that the spirit and the letter of the RFS is supported as intended by Congress,” Ernst spokeswoman Leigh Claffey said. The meeting on Wednesday included staff from the offices of Cruz and Republican Pat Toomey of Pennsylvania, both representing the oil-refining industry. On the corn side, staff attended from the offices of Grassley, Ernst and Deb Fischer of Nebraska. Officials from the White House, the U.S. Environmental Protection Agency and the U.S. Department of Agriculture also attended. Prices of renewable fuel (D6) credits were traded at roughly 74 cents on Wednesday, its lowest levels since early October, according to traders and Oil Price Information Service. The credits were trading at 90 cents each at the end of November. Traders also cited some unexpected selling by small refiners that were granted waivers from the program by the U.S. Environmental Protection Agency. “The small refiners were bringing the price down, but the talks in DC really added fuel to the sell off,” a trader said. The RFS was introduced more than a decade ago by former President George W. Bush as a way to boost U.S. agriculture, slash energy imports and cut emissions, and it has since fostered a market for ethanol amounting to 15 billion gallons a year. Refining companies – like Philadelphia Energy Solutions and Monroe Energy, both of Pennsylvania, along with Valero Energy Corp in Texas – that do not have adequate facilities to blend biofuels into their products are required to purchase blending credits called RINs from rivals that do. They have pressed the administration to adopt reforms that would lower the credit costs, but the ethanol industry has successfully defeated those efforts. In a 3-2 vote Thursday, the Federal Communications Commission repealed Obama-era regulations known as net neutrality that monitored service providers that connect users to the Internet. In April, Congress voted along party lines to repeal the rules that would have prohibited Internet service providers (ISPs) from selling or sharing web browsing habits of its consumer base. Thursday, the FCC voted to repeal the protections that prohibited broadband providers from blocking websites or creating a tier-based system that would see users pay for curated content. Opponents fear ISPs like Comcast or Verizon could throttle speeds of users in order to direct traffic to different websites or services. However, Republican lawmakers have cited the rules as yet another example of government overreach, and have praised the repeal as fairer treatment of internet use. The federal government will no longer regular internet service like a utility. “Net neutrality helps ensure the Internet is free and open so consumers can access the content and services they want, and web services and content creators have an equal shot at reaching Internet users,” Casey offered in a statement via communications director John Rizzo. Pennsylvania Attorney General Josh Shapiro upped the ante on the doom and gloom regarding the ruling Thursday, saying “the vote by the Federal Communications Commission to gut Net Neutrality could end the Internet as we know it. “The FCC action undermines free speech and is bad for consumers and business – especially startups and small businesses,” Shapiro continued in a statement. Shapiro alleges that more than 1 million fake comments were sent to the FCC about net neutrality, and said he had rallied 17 other attorneys general to delay Thursday’s vote in order to allow state and federal investigators to dig into those fake comments. Visit badcomments.attorneygeneral.gov to look and see if your name was used fraudulently to influence the FCC’s process. The Attorney General’s office will investigate all reports made through this site and this information may be important to future legal action. The chairman of the FCC, Ajit Pai, who was nominated by President Donald Trump in January, said the rollback of the regulations would eventually help consumers. In Philadelphia, Comcast once had an exclusivity agreement with the city to be the only ISP in town. Once that 10-year agreement ended, Verizon began offering broadband services within city limits. Comcast, the largest cable operator and the largest home Internet service provider in the United States, is also among the top contributors to political campaigns. In the 2016 election cycle, Comcast gave $12,594,527 in campaign contributors across all parties. Comcast was among the top donors to the campaigns of Meehan, Rep. Ryan Costello, R-6 of West Goshen, and U.S. Senator Pat Toomey, R-Pa., all of whom voted in favor of the repeal earlier this year. Disney now has a controlling stake in Hulu, which was a joint effort between Comcast and Time Warner to compete with YouTube. Comcast and Time Warner are now minority stakeholders in Hulu. Comcast owns NBCUniversal, which broadcasts shows on Hulu. Time Warner is in negotiations to be bought by AT&T, a competitor of Comcast. Time Warner is a competitor of both NBC and Disney. Comcast and AT&T control the network that people use to watch content from Disney, Time Warner, and NBC. “We fundamentally restructured the tax code so American workers and businesses can compete in a global economy,” he said while speaking from his Old City Philadelphia offices Monday morning. Toomey touted the finer points of the bill, which would double the standard deduction for the first $24,000 of earned income, eliminate the individual mandate on Obamacare and lower the corporate tax rate from 35 percent to 20 percent. “Our [corporate tax code] is a glaring outlier that makes the U.S. less competitive,” he said. Early Saturday morning the Tax Bill was passed in the Senate. The bill was passed on a 51-49 vote along party lines. NBC10’s Drew Smith has more about how the new tax bill will impact you. In Pittsburgh, demonstrators gathered ahead of Toomey’s news conference in protest over the bill, which passed while most Americans slept. The Senate bill inched forward strictly on party lines with just one Republican, Sen. Bob Corker of Tennessee, voting against it. Meanwhile, Democrats decried the bill, saying none of them had time to read the proposed legislation before voting late Friday night into early Saturday morning. “The Democrats can say what they want,” Toomey shot back Monday. The nearly $1.5 trillion tax bill gave President Donald Trump a major push towards fulfilling one of his biggest campaign promises. It offers the boldest rewrite of the nation’s tax system since 1986. But Toomey has come under fire for pushing an endowment tax change that would largely benefit just one institution – Hillsdale College, a private Michigan school that has a reputation for being unfriendly to LGBTQ students and refusing to follow Title IX rules aimed at protecting students against sexual assault. The two-term Republican spoke at the college in 2008 and defended his amendment by saying that it would benefit any private college that does not accept federal funds for tuition aid, like Hillsdale. Instead, colleges like Hillsdale are “saving American taxpayers” by not accepting federal funding. But Democrats immediately cried foul over the plan because it appeared to benefit only a single college, Hillsdale College, whose president, Larry Arnn, is influential in conservative intellectual circles. Arnn, who was floated last year as a potential pick to be President Donald Trump’s Education secretary, has served as a Heritage Foundation trustee since 2002. The school also has close ties to the family of Education Secretary Betsy DeVos. “This is a very limited provision written for a very special person,” Sen. Claire McCaskill (D-Mo.) said on the Senate floor, noting the school’s connections to the DeVoses. Betsy DeVos’ brother, Erik Prince, is a Hillsdale graduate, according to the college website. According to the Hillsdale Collegian newspaper, DeVos’ father-in-law, Richard DeVos, co-founded Amway with Jay Van Andel. Van Andel’s son, Steve, is a Hillsdale graduate and Amway leader, and the Hillsdale graduate school of statesmanship was named in his honor after he made contributions to graduate school operations and scholarships, the newspaper said. Just hours after U.S. Sen. Jeff Flake, R-Ariz., made a blistering retirement announcement, Pennsylvania’s Republican U.S. Senator is having his say. Flake shocked the GOP establishment with an unscheduled floor speech on Tuesday, where he excoriated President Donald Trump without mentioning him by name. “Flake’s speech echoed concerns and criticisms leveled in recent days by former presidents George W. Bush and Barack Obama and Sen. John McCain (R-Ariz.), who also pointed to the coarse nature of the nation’s politics and the character of current leaders — subtle, indirect, but indisputable commentaries on Trump. ” … For almost a year, Flake has faced a primary challenge from Kelli Ward, a former Arizona Republican state senator who unsuccessfully challenged McCain in 2016 by raising concerns about his age and conservative bona fides. Against Flake, Ward raised similar questions about the incumbent’s political motivations and adopted the brusque nationalistic tone that Trump used successfully during his presidential campaign. She has sought Trump’s favor, but he has so far declined to pick a favorite Flake challenger. Michael Gerson’s Oct. 14 column (“America Urgently Needs Republican Vertebrates”) should be read daily in the halls of Congress. I call our Sen. Pat Toomey almost twice a week. I want my senator to say or do something about the daily lies, threats, inappropriate comments and insults: “Liddle’ Bob Corker,” “Rocketman,” other nasty names, mention of blood or bleeding almost always about women, references to low IQ, lies about Barack Obama not recognizing Gold Star families — the list of unhinged comments and lies goes on ad nauseam. When I get to actually speak with someone at Mr. Toomey’s office, they say that he has not made a comment or has not made a statement at this time. Why not? What is he waiting for? Mr. Toomey is in denial about this incompetent president, and his complicit silence is condoning this behavior. Mr. Toomey won by only 1.7 percentage points. His mandate is to cooperate and compromise! People are saying that a sitting senator can be unseated for not being responsive to his constituents. Vertebrate up, Mr. Toomey! EASTON, Pa. (AP) — A man who was kicked out of a televised town hall for asking Republican U.S. Sen. Pat Toomey an unsettling question about whether his daughter had been kidnapped won’t face charges, a prosecutor said Monday. Republicans want to learn more about a device reportedly used in the mass shooting in Las Vegas. Top Senate Republicans said Wednesday they are open to considering legislation banning devices that were reportedly used to gun down scores of people in the worst mass shooting in modern American history. Bump stocks — also known as “slide fire” devices, which work by rapidly “bumping” the trigger of a semi-automatic weapon to boost the rate of fire — were reportedly used by Stephen Paddock to kill 58 people and wound more than 500 in Sunday’s Las Vegas massacre. 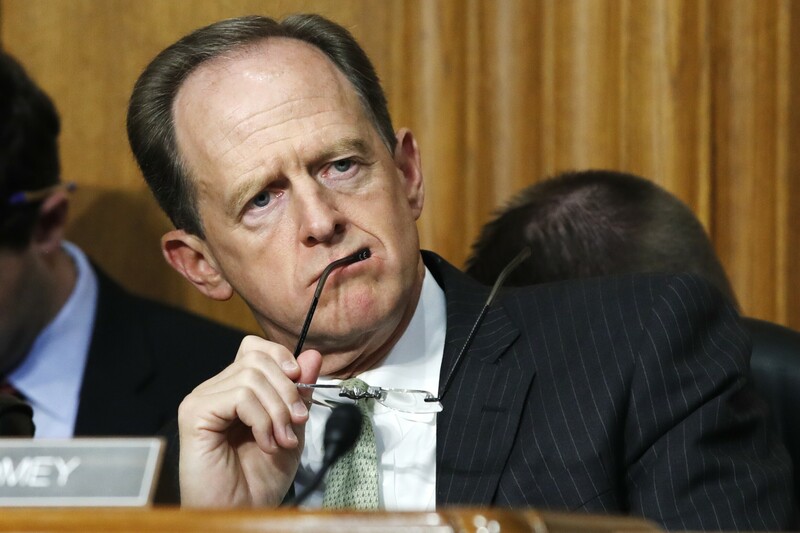 …Even Pennsylvania Sen. Pat Toomey, the Republican namesake for legislation four years ago that sought to expand background checks, was unpersuaded that lawmakers should pass a bill barring bump stocks. However, he said in a statement later Wednesday that he is open to hearings on the issue. WASHINGTON — Republican leaders on Wednesday proposed slashing tax rates for the wealthy, the middle class and businesses while preserving popular tax deductions that encourage buying homes and giving to charity, according to a nine-page framework they hope will eventually unify the party behind a proposal to revamp the U.S. tax code. Senate Republicans have reached a deal that would allow for large net tax cuts as part of their budget document, but the agreement does not rule out the possibility of a revenue-neutral tax reform, one that raised as much revenue through elimination of loopholes and economic growth as it lost through lower rates. Sen. Bob Corker, one of the parties to the deal, said Monday he has no intention of voting for an ultimate Republican tax bill that would add to federal deficits, even though some reports suggested that the deal would lead to the government losing $1.5 trillion in taxes over the next decade. Instead, the Tennessee Republican said, the mysteriously detail-free deal he announced last week with fellow Budget Committee member Pat Toomey was meant to give “headroom parliamentarian-wise” for GOP senators to negotiate a tax bill within the constraints imposed by the Senate’s arcane procedural rules. Pennsylvania Democratic Sen. Bob Casey didn’t offer his support to a Medicare-for-all plan Sen. Bernie Sanders proposed Wednesday, saying he is focused instead on stopping a new Republican effort to repeal and replace Obamacare. Sixteen Senate Democrats co-sponsored Sanders’ proposal, according to the Vermont senator’s office. The legislation would provide more generous benefits than the current Medicare program at an as-yet-unknown price. “My first priority is protecting health care for Pennsylvania families, who are paying higher premiums and seeing increased costs because congressional Republicans and the administration are taking actions to undermine and sabotage our health care system,” Casey, of Scranton, said in an emailed statement. Four Republican senators introduced a proposal the same day that would get rid of many of the 2010 Affordable Care Act’s subsidies, taxes and its requirements that most people have insurance. The proposal would give states more flexibility in administering health care and replace some federal funding streams with block grants, according to a news release. Steve Kelly, a spokesman for Sen. Pat Toomey, said in an email that the Lehigh Valley Republican is still reviewing the bill, which was introduced by Sens. Lindsey Graham, R-South Carolina; Bill Cassidy, R-Louisiana; Dean Heller, R-Nevada; and Ron Johnson, R-Wisconsin. Kelly addressed Sanders’ proposal in a statement that referenced an Urban Institute analysis of a single-payer proposal Sanders put forward as a presidential primary candidate last year. The analysis estimated the plan would increase federal spending by $32 trillion between 2017 and 2026 while providing insurance for most of the people who are still uninsured. U.S. Rep. Lloyd Smucker agrees with the Trump administration’s decision to seek a legislative fix for the Obama-era program that protects children of undocumented immigrants, the congressman said in a statement Tuesday. A Northampton County, Pa., man removed from Sen. Pat Toomey’s town hall meeting after he asked the Republican senator about nonexistent reports that Toomey’s daughter had been kidnapped said Friday he was disappointed to learn that police intend to charge him. Others found Mr. Radecki’s question startling. PITTSBURGH (KDKA) — Demonstrators across the country took to the streets in response to the violent white nationalist rally in Charlottesville on Saturday, as Pennsylvania politicians took to Twitter to voice their opinions. Pennsylvania U.S Senator Pat Toomey is hoping special counsel, Robert Mueller, will wrap up his investigation of Russian Collusion and whatever else he might be looking for in a timely manner. Toomey was a recent guest on WNPV’s AM Edition. As the Senate headed toward a vote early Friday that Republicans intended to set up health care talks with the GOP-controlled House, the votes of Pennsylvania’s two senators were not in question. Ahead of Tuesday’s U.S. Senate Republican-driven effort to repeal and replace the Affordable Care Act, three Pennsylvania leaders joined to once again denounce the health care plan and warn about its negative impact on the state. “It’s a bad piece of legislation for virtually everyone we can think of,” U.S. Sen. Bob Casey, D-Lackawanna County, said of the Republican plan, which U.S. Sen. Pat Toomey, R-Lehigh County, helped craft as part of a 13-member Senate GOP panel. WASHINGTON — U.S. Sen. Pat Toomey is proposing stiff economic sanctions to deter North Korea from developing its ballistic missile program. The aim is to force North Korea to stop developing nuclear weapons by cutting off its access to the international financial system, said Mr. Toomey, R-Pa., and Chris Van Hollen, D-Md., who are sponsoring a bill together. Sen. Pat Toomey says a new version of the Republican health-care bill is expected, and he hopes it can appeal to both sides of his party’s divide. At a town hall in Pennsylvania on Wednesday night, the Republican senator Pat Toomey faced an angry protest over his role in the GOP healthcare bill, while Ted Cruz was heckled over his suggested amendment to the legislation at an event in Texas. Regardless of what Sen. Pat Toomey may say, the new Senate health care bill does cut federal spending to Medicaid, and does so in a significant way. Medicaid is a federal program designed to provide health insurance to those who otherwise cannot afford it, and as of April 2017 nearly 75 million Americans were enrolled in the program. Currently, the program and those enrolled in it are at risk. When the Affordable Care Act came into law, it greatly expanded Medicaid, both the number of people that the program covers and what is covered by the program. But both the GOP House and Senate bills as they stand would make significant cuts to a crucial program in our nation’s social safety net as compared to the current law. However, Toomey is insistent that Medicaid isn’t facing any cuts, explaining his point of view in a CBS interview Sunday. However, directly contradicting the Pennsylvania Republican, the nonpartisan Congressional Budget Office reports that by 2026, Medicaid will face a 26 percent cut compared to the current law with 22 million Americans losing coverage under the bill. GOP lawmakers and outside groups are divided over whether Congress should lengthen the budget window to facilitate tax cuts. Supporters of making the budget window longer than 10 years argue it would allow Congress to pass temporary tax cuts that could last for a longer period of time. Opponents think that tax reform should be permanent and therefore revenue neutral. The idea of a longer window has gained support since Sen. Pat Toomey (R-Pa.) first floated the idea in early May, but the idea has yet to gain traction with GOP decisionmakers. What did Toomey mean by “no one loses coverage?” And how will the Senate plan affect coverage for people who became eligible for Medicaid under Obamacare? Steve Kelly, Toomey’s press secretary, said that when the Senator said “no one loses coverage” he was referring to federal eligibility for expanded Medicaid and was not saying no single person would lose coverage. Sara Rosenbaum, the Harold and Jane Hirsh Professor of Health Law at George Washington, said Toomey “conflates two things.” She said the Medicaid eligibility category for adults below 138 percent of the federal poverty level was continued. HARRISBURG — At a rally Friday morning in the state Capitol, U.S. Sen. Bob Casey urged voters to help him and other Democrats defeat the Senate Republicans’ plan to replace the Affordable Care Act. He spoke a day after Senate Republicans unveiled their long-awaited proposal to replace Obamacare, a bill their leaders hope to bring to a vote next week. With Republicans clinging to a two-seat majority in the chamber and Democrats unified against the plan, every vote will count. Mr. Casey said debate about the bill had paid too little attention to how the proposal would affect people who get their health insurance through their employers — more than 150 million Americans. “If you’ve got employer coverage, they’re coming for you, too,” he said. “Because if you live in a state in the future where there’s a waiver, you will not get protection from pre-existing conditions. Bill, but Do Republicans Have the Votes? he 52 Republican senators have been meeting several times a week behind closed doors to develop a bill to repeal and replace the Affordable Care Act. At least 50 of them must be on board for the bill to pass, and they could try as soon as next week. In announcing that the U.S. will withdraw from an international agreement seeking to combat climate change, President Donald Trump pointed to places like Pittsburgh in explaining his rationale. “It is time to put Youngstown, Ohio, Detroit and Pittsburgh, along with many, many other locations within our great country, before Paris, France,” Trump said Thursday as he argued that the agreement would have “draconian” effects on the U.S. economy. Pittsburgh’s Democratic mayor disagreed with Trump’s assessment of the deal, which Trump promised during last year’s presidential campaign that he would abandon. “As the mayor of Pittsburgh, I can assure you that we will follow the guidelines of the Paris Agreement for our people, our economy and future,” Mayor Bill Peduto responded in a Twitter post. The move will not fully take effect for four years, under the terms of the agreement. Other Pennsylvania Democrats joined him in criticizing Trump’s decision. Republicans, including top GOP leaders in Congress, largely welcomed withdrawing from the climate pact. U.S. Rep. Lou Barletta, whose 11th District includes part of Carbon County, said the deal would have been “disastrous” for workers and consumers. “Ending anti-growth obstacles like the Paris Agreement opens the way to a brighter future, with America in the lead,” said U.S. Rep. Keith Rothfus, whose 12th District includes Pittsburgh’s northern suburbs. “Senator Toomey supports the withdrawal from the Paris Accord as it would not have protected our environment and would have been particularly harmful to our economy and job creation,” said Steve Kelly, a spokesman for U.S. Sen. Pat Toomey, R-Pa.
U.S. Rep. Charlie Dent, R-15th District, which includes Lehigh County and part of Northampton County, was on a congressional trip in Germany and did not have a comment. Meehan is one of three Pennsylvania Republican congressmen who signed on to a bipartisan letter in April urging Trump to remain in the agreement. U.S. Reps. Ryan Costello of the Chester County-based 6th District and Brian Fitzpatrick of Bucks County’s 8th District also signed the letter, which showed support for working with other countries to reduce greenhouse gas emissions. Costello and Meehan both represent districts that Democrat Hillary Clinton won in last year’s presidential election. She also won Allegheny County, where Pittsburgh is located. President Trump is under fire for sharing classified information with Russia. Some officials say that information was classified and could expose the source of the information and how it was collected. Several Republicans from the Philadelphia region raised questions Wednesday about President Trump’s decision to fire FBI Director James Comey, though mostly in less sharp terms than Democrats. U.S. Sen. Pat Toomey announced today that he’s hosting yet another “tele-town hall,” meaning no face-to-face meeting yet for the thousands who’ve besieged his statewide offices in protest for months. If Congressional Republicans thought they had gained the power to disregard the rules with their victories in last November’s elections, they couldn’t have been more wrong. U.S. Sen. Pat Toomey brought his message of support for increased federal defense spending to an appreciative York County audience Friday afternoon. Standing amid a line of khaki-painted military vehicles, Toomey praised the efforts of manufacturing workers at BAE Systems as vital to national defense. “York has long been an important manufacturing center,” Toomey told employees gathered to meet the Republican senator as he completed a tour of the West Manchester Township defense contractor’s plant. BAE’s 1,250 employees “are an absolutely critical part of that,” the senator added.